Australia is the sixth largest country in the world but it has the lowest population density in the world – only two people per square kilometre. The total population of Australia is 23,123,916. Australia’s biggest attraction is its natural beauty. The landscape varies from endless sunbaked horizons to dense tropical rainforest to chilly southern beaches. Australia boasts nearly 10,000 beaches—more than any other nation. 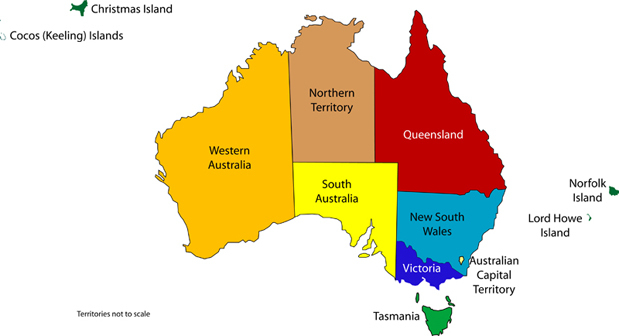 Australia is made up of six states (Victoria, New South Wales, Western Australia, Queensland, South Australia and Tasmania) and two territories (Northern Territory and Australian Capital Territory). Each state and territory has its own parliament, flag and floral emblem. On 1 January 1901 Australia became a federated nation after the six colonies were bound by one parliament, one constitution and one flag. The capital city of Australia is Canberra. In 1770 Captain James Cook sailed into what is now called Botany Bay. The colony of New South Wales was founded in 1788 and originally comprised much of the Australian mainland, as well as Lord Howe Island, New Zealand, Norfolk Island and Van Diemen’s Land. There are many reminders of the original inhabitants of NSW, the Aborigines, around Sydney with more than 2,000 Aboriginal rock engraving sites. Many of Sydney’s suburbs have aboriginal names such as Woolloomooloo, Parramatta, Woollahra, Toongabbie and Yagoona. NSW is the home of Australia’s highest mountain peak, Mount Kosciusko, which towers 2,228 metres above sea level. It is surrounded by the snow-capped ski fields of the Southern Alps of NSW while Australia’s longest river, the Darling River, flows 2,740km from northern NSW to join with the Murray River near the Victorian border in the state’s south-west. NSW is the most populated state in Australia and has a population of 7.29 million people (in June 2012), with over 60% of that population is based in Sydney. Sydney is the largest and oldest city in Australia. With sandy beaches to the east, National Parks to the north and south, and mountain ranges, plateaus, upland areas and escarpments to the west, there is a huge variety of things to do and see. Sydney is a sophisticated multicultural city full of choices —whether you want entertainment, shopping, sightseeing or relaxation. Situated on the magnificent Sydney Harbour, spanned by the landmark Harbour Bridge, Sydney’s waters are constantly criss-crossed by busy ferries and colourful sailing yachts and cruisers. Overlooking the Harbour are the Botanic Gardens leading down to the Sydney Opera House. Most areas in Australia are 2-3 hours ahead of Asia, 4-5 hours ahead of the Indian subcontinent, 9-10 hours ahead of Europe and 16-20 hours ahead of the Americas. Daylight saving (Summertime) operates in most Australian states from late October to late March. Homestay is a type of accommodation for students from another country staying with a local Host family whilst they are studying abroad. A homestay is a popular option for students who need a safe, economical and convenient place to stay. Students can adjust quicker in a new environment with the friendly support offered by Host families. They have the opportunity to make new friends, experience the Australian lifestyle, culture, weather, and society and practice their English and participate in the daily routine of the Host family’s life. Wentworth Institute works in conjunction with Meridian Homestay Services (www.meridianhomestay.com.au) to deliver high standards in Homestay for their students. All Host families are inspected by Meridian Homestay Services to ensure they meet Federal Government supported standards. It is mandatory for all Host families to have a Working with Children Check, and commit to Host insurance. They also offer a 24-hour, 7-days a week Emergency Support Service, for students and Host families. * The information provided here is intended as a guide only and does not constitute advice nor should it be relied upon as constituting advice by WIN or its representatives. Public transport is very easy in Sydney and is also fairly cheap. The institute is located a few minutes walking distance to Sydney Central trains and buses. Transport Info line 131 500 or check the trip planner at www.transportnsw.info or You can also use the bus route finder athttp://mysydney.nsw.gov.au/bus. An Opal Card will make travelling on buses, trains and ferries convenient and will include any discounts you may be entitled to. Taxis are a fairly expensive mode of transport and the use of a private car to the institute is not recommended due to the difficulty of parking in Sydney. Overseas Student Health Cover is a compulsory requirement of DHA– all student visa holders must have Overseas Student Health Cover. If you are going out on the town to bars and clubs keep a careful watch over your drinks/or have a designated person to watch over everyone. If you are in a major accident or you feel your life is in danger use your cell phone and contact the police, fire or ambulance 000. You must swim inside the flags, swimming outside these flags can be dangerous and the lifeguards maybe not to be able to see you if you need help. Wave towards the beach or at a lifeguard if you need help. In summer the UV can be extreme. Remember: Slip on a shirt, Slop on some Sun Screen (maximum strength), Slap on a hat. Drink plenty of water and sports drinks to replace salt if playing sport in the sun. If you see a snake, don’t approach it or harass it. There are many fun things to do in Sydney a lot of them can be free! Have a beach party or Picnic in the large parks around the city and suburbs; attend the free music festivals, such as opera or rock in the park at the Domain in the centre of the city, there are often free festivals on at Darling Harbour. Or see free shows such as Vivid where Sydney puts art and light shows on buildings or do some great walks around the beach fronts, see sculpture by the sea which is one festival that happens every year. Most all art galleries and Museums are free. There are websites such as meet up where you choose something you would like to do and join a group of bush walkers, diners or theatre goers. The Head of Operations / Counsellor will help you with any interpreter assistance. We have access to an interpreter twenty four (24) hours a day. Be aware of Telstra’s twenty-four (24) hour interpreter service. Telephone 131 450 – if anytime you are having difficulty communicating in English.